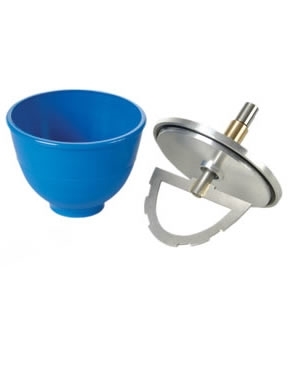 350g Flexible mixing bowl and Spatula Mixer. The Flexible Vac-U-Mixer is what technicians have been asking for … A smart alternative to hard plastic mixing bowls. Few things frustrate dental assistants or model technicians more than stone that has hardened in an expensive bowl. They must scrape the bowl manually, often damaging it beyond use. Many times, the hardened stone cannot be removed at all. Enter the revolutionary Flexible Vac-U-Mixer for the Vacuum Power Mixer, Combination Unit and VPM2. With just a firm squeeze, the technician can crack and release a majority of the hardened stone without damaging the bowl. The Flexible bowl has a higher impact resistance than a standard mixing bowl.